ThermoFab - Art To Part - From Files To Finished Product in 4-6 Weeks! From Files To Finished Product in 4-6 Weeks! 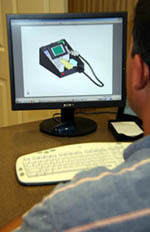 ThermoFab works with clients in many different stages of their product development. Some clients come to us with a concept, others have completed CAD files. Some are bringing a product to market for the first time, others are revamping existing products. Some clients are working with a designer, others ask for our help to complete the design. Regardless of where they are in their product design cycle, all these clients know that ThermoFab offers the highest quality products with the shortest time to market and the highest degree of details at volumes they need to meet their forecasted demand. The photos on this page provide an example of one project that we took from art to part. 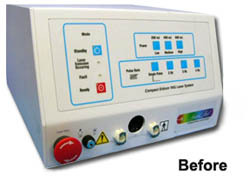 When this company, the world’s leading provider of light-based products for medical and aesthetic skin care, came to ThermoFab they knew they wanted and up-to-date look for a product they already had on the market. The client asked ThermoFab for assistance with revamping their current design. The designer chosen for the product hand rendered three different design concepts. Each drawing was presented to the client for feedback. ThermoFab worked closely with the client while coordinating the design process in order to provide input on manufacturability. Because of our proprietary process, clients achieve their time to market goals and can get greater detail in the product, than they could with other thermoforming manufacturers. Though we collaborate closely with all clients, ultimately they choose what makes the most sense for them based on their target market. Our goal is to provide sophisticated design choices and manufacturing expertise so the direction the client chooses can be manufactured quickly and with high quality. Once the design was selected, ThermoFab’s expert design and engineering team went to work converting it into CAD. Whether a client provides completed files or wants our assistance, we look at the product from many different perspectives to ensure it will meet or exceed our client’s expectations. Here, one of our engineers reviews the file to see how the enclosure fits together and how the internal components fit inside. At this point, additional design adjustments might be recommended to ensure the product meets the client’s design specifications without losing manufacturability or quality. 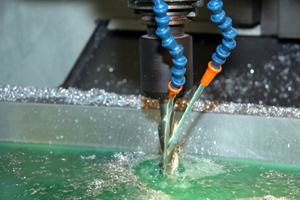 ThermoFab only uses high-quality aluminum, temperature controlled tools. We produce them in-house, providing us with the greatest level of control and quality. As a result of the ongoing research and development provided by ThermoFab Technologies, we have developed proprietary processes that allow us to put more action in the tool, leading to a greater degree of detail. Once the tools are complete, we start with the highest quality material that meets your expectations and begin production. 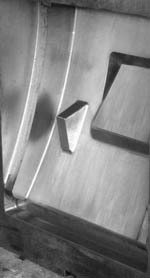 We have inspection throughout the process and use either our 3-axis or 5-axis CNC Machine to route the most intricate shapes and provide detailed finishing with maximum repeatability. 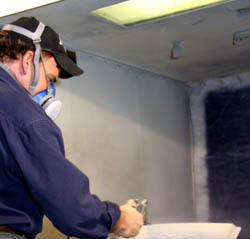 Our in-house painting and inspection processes provide the greatest control and color matching. 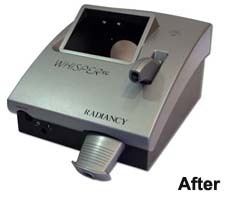 For this product, we also screened the product and company name on the finished piece. ThermoFab ships the top enclosure, the base (from sheet metal we sourced), the handheld laser enclosure connection as well as the unit hose connection (one with the product name tooled into the plastic) to the client for final assembly. 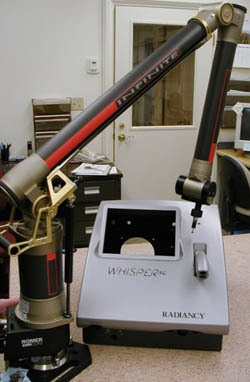 However, for many of our clients we handle product assembly and ship from our dock direct to their stock. Want to find out if we can do all this for your product? Contact Us now!